Aco. is the best remedy at the onset, but this stage is generally passed without treatment. Indicated in the acute cases when the attack comes suddenly after an exposure to dry cold air, exposure to draught of cold air while perspiring (suppressed perspiration). It should be administered just as soon as the patient realizes that he is taking cold. Frequent sneezing. There is yet no discharge, but the nose is swollen, hot, dry and stopped up. This stoppage is apt to change from side to side. Tingling and burning in the nose. After some hours chilliness followed by fever. Unquenchable thirst for large quantities of cold water. P. is very similar to Aconite and may be used when the onset is less sudden and violent and when there is no anxiety and restlessness. Fluent coryza with frequent violent sneezing. Nose swollen. Stoppage of the nose, especially at night with thin, watery excoriating discharge. Yet in spite of the fluent coryza the nose feels stopped up. Smarting and burning at the nostrils as if they became sore from it. Nose colds descends to chest. Coryza better in warm room. One of the best remedies for cold and coryza. Coryza from exposure to damp cold winds and from getting wet. The discharges from the nose are watery, acrid and excoriating. They corrode the nose and upper lip. Profuse coryza and headache, cough and hoarseness. Excoriating discharge from the left nostril. Bland watery discharge from eyes. Coryza worse in the evening. A peculiarity of Al. Cepa is that the discharge ceases when the patient goes into the open air but returns when entering a warm room again. 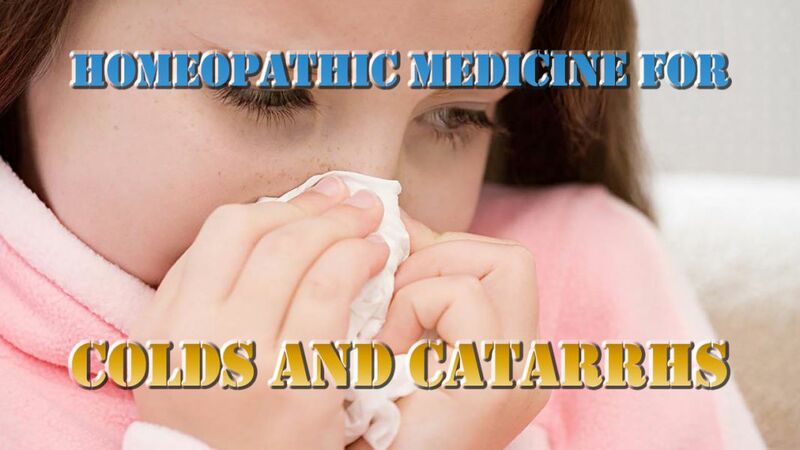 Profuse watery and extremely acrid discharge from the nose and bland (non-irritating, mild) profuse watery discharge from eyes is the characteristic of Allium Cepa (opp. Euphrasia). Sometimes patient complains of laryngitis with severe cough, which compels him to grasp the larynx. Like Allium cepa—Euphrasia has profuse fluent coryza from nose and profuse lachrymation. But Euphrasia is exact opposite of Allium Cepa. In Euphrasia nasal discharge is bland and tears are scalding, where as in Allium Cepa there is profuse acrid discharge from nose and lachrymation are bland. Profuse acrid lachrymation with profuse bland coryza is the characteristic of Euphrasia. Profuse fluent coryza with cough. Kali Bi. is useful in chronic coryza. Discharge tough and stringy, greenish, yellow, yellowish-green. Coryza worse in the evening and in the open air. First fluent coryza, relieved by warmth, but in the later course of the disease, tough, stringy, tenacious discharge, adherent mucus, which can be drawn out into long strings. Patient wants to blow nose, but no discharge appears. There is a feeling of dryness in the nose. Pressure at. the root of nose. Loss of smell. Obstruction of nose, especially right, with discharge, worse in the evening and morning. Inability to breathe through nose. Tickling as from a hair in left nostril. Feeling of dryness in the nose. Feeling of pressure in the nasal bones. Sensation as if the nose was swollen and stiff. Nux. Vom. is suited to initial stage of the ordinary coryza, particularly when it has been caused by exposure to dry, cold winds or sitting in a cold place. It should be given as soon as dryness and tickling in the nose begins. It is of little use after cold has established. Frequent violent sneezing, especially in the morning. Watery discharge. The coryza is fluent in the morning but becomes dry in the evening and at night (stuffed up at night). Scraping in the throat and oppression about the front sinuses. The nasal passages are alternately free and obstructed. Obstruction of nose, alternating sides, especially at night, has to breathe through mouth. Aching all over the body and headache. Coryza worse in the warm room and better in the open air. This remedy is useful in the beginning of coryza. It breaks up a cold at the beginning quicker than any other remedy. Fluent excoriating coryza which makes the nostrils and wings of the nose raw and sore. Frequent paroxysm of sneezing especially in the morning with watery, excoriating or bland discharge from the nose. The patient is dull and wreak. Body ache and dull headache (which is relieved by urination). Patient feels better in open air. Obstruction of nose, cannot lie down, especially at night, has to breathe through mouth. Loss of taste and smell during coryza. Obstruction of nose alternating with fluent discharge and dullness of head. An attack of cold commencing with violent sneezing. Coryza with clear, watery, transparent (resembling white of an egg) discharge from the nose. Great dryness of posterior nares. Loss of taste and smell. Wings of nose sore. It is one of important remedies for an acute coryza, which is watery and excoriating. Incessant sneezing. The discharge is quite acrid and. makes the nostrils sore. Nostrils are sore and there is a constant desire to bore the finger into the nose. The nose may be completely stopped up and at the same time there is fluent acrid discharge. Nose stopped up worse left side. Continual discharge from left nostril sneezing worse at night. Profuse watery, hot, excoriating, thin discharge call for this remedy. Violent attacks of coryza with violent sneezing and lachrymation. Nose red and swollen, tip of nose is red. Coryza worse in cold air. Nasal catarrh involving frontal sinuses, tightness at the root of the nose. There is profuse coryza which extends to the frontal sinuses, burning in eyes and nose excoriating discharge, violent sneezing. The nose itches and burns and feel stuffed up. The throat feels raw and sore. Perspiration but no relief from it. It is also useful when the cold is ‘ripe’ and the nasal discharge is yellowish green and thick. Hep. Sul. is useful is advanced stage of coryza. It should not be given in the beginning of coryza. It is useful in chronic coryza. The nose is stopped up every time when the patient goes out into the open air. Coryza is relieved in a warm room. Nose swollen and sore to touch, especially inside of alae or wings of nose. Discharge is thick, greenish-yellow or yellowish green, bloody. Sneezes every time the patient goes into a cold dry wind. Puls. is useful in an advanced stage of coryza (ripe cold), when the nasal discharge is thick, yellowish or yellowish green or green and above all bland. Obstruction of nose and dry coryza, principally in the evening and in a warm room. Tickling in nose and frequent sneezing, principally in morning and evening. Better in open air and worse in the evening. Puls, should not be given in the beginning of coryza. This remedy is especially useful for winter coryza. Nasal catarrh and acute coryza and stoppage of nose at night, alternating sides. Excoriating discharge and rawness and burning along with the trachea. Itching and tingling in nose. Obstruction of nose, alternating sides. Coryza and severe frontal pains and redness of eyes and lachrymation. Fluent coryza worse odors of flowers, even thinking of flower increases the discharge. Excessive sneezing, shaking the whole body. Coryza and free secretion of transparent mucus which is sometimes viscid and yellowish-grey, more rarely watery. Nasal discharge first thin, latter thick. Dry coryza from cold wet weather, from getting wet, change of weather, complete stoppage of nose. Coryza worse in open air. Coryza from cold damp weather, exposure to cold when perspiring. Nose stopped up with every cold.